Facebook is doing something historic tomorrow night at 5pm EST. Former President George W. Bush will be visiting the Facebook HQ for a Facebook Live event. This is something that no other United State President, or any President for that matter, has ever done and will surely be an historic moment not only for President Bush, but also for Facebook. President Bush is currently promoting his memoir Decision Points. And during this Facebook Live event, viewers will be able to submit questions live via the Facebook comment box and Bush will then answer some of the questions. 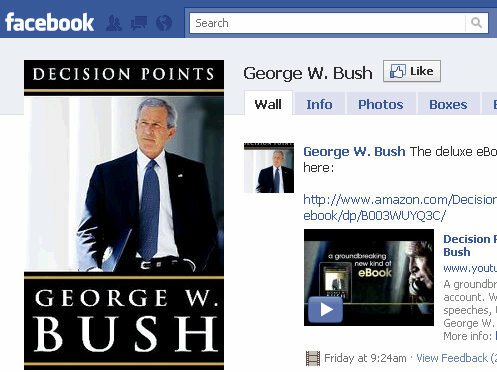 Bush launched his own Facebook Page back in June and he now boasts over 600,000 fans.